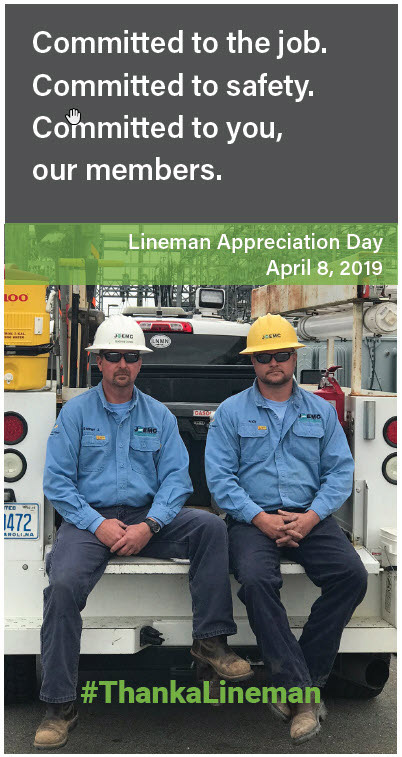 Every year, the second Monday in April marks Lineman Appreciation Day, a celebration of the vital role linemen play in keeping the lights on for co-op members. On this day, JOEMC and electric cooperatives across our state and nation recognize the skill, talent, and expertise of our linemen and thank them for their many contributions to our daily lives. This past year was especially challenging for many co-operative linemen, as they worked tirelessly to help communities throughout North Carolina recover from the impacts of multiple hurricanes, as well as snow and ice. In a true demonstration of the cooperative spirit, crews from less-affected areas traveled to harder-hit regions to assist in restoring power as quickly as possible, often in very treacherous conditions.